Item #IGM-LL-12-18-249SS: 18" long Necklace of 12mm round Lapis Lazuli Beads; Large Sterling Silver spring ring clasp. 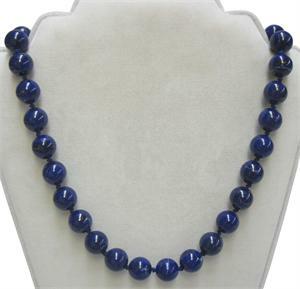 Item #DB-1072: 28" long Necklace of 8mm round faceted Lapis Lazuli Beads of 312.30 cts. TW with 9.5mm round 14Kt. Yellow Gold & Diamond hook and slide clasp. Item #DB-2689: 30" long Necklace of 7mm round natural Lapis Lazuli Beads with 14Kt. Yellow Gold slide clasp and safety with 10 x 10mm Lapis Lazuli Cushion Flat Top Cab . Item #DB-1074: 30" long Necklace of 8mm round faceted Lapis Lazuli Beads of 309.00 cts. TW with 15mm long barrel shape 14Kt. Yellow Gold and Lapis Lazuli slide clasp and safety. Item #DB-2074: 31" long Continuous Strand Necklace of eighty-four 8mm round Natural Lapis Lazuli Beads and three 7.5mm round 14Kt. Yellow Gold Filigree Beads. Item #LL-BE-15: 6mm round Lapis Lazuli bead earrings with Sterling Silver post backs.